Found by chance after a worldwide search, 1994 was the year New Jersey artist, Shannon (MacDonald) was discovered by Bill Heckle and Ray Johnson at a Connecticut Beatles Convention "that almost didn't happen". A faulty transmission nearly stopped the artist from being at the fab-festival - a festival that changed her life for better - forever. 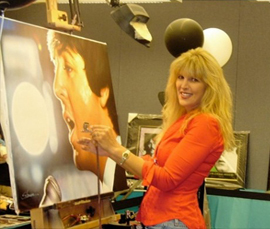 After many hours of wowing a crowd of thousands by painting many images of The Beatles all day, the next morning Shannon and her amazing art were front page news. 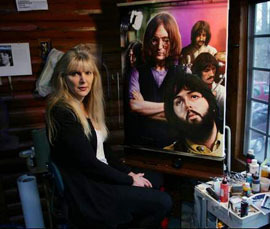 The Connecticut Newspaper's plans to have John Lennon's ex-wife, Cynthia Powell, front and center had suddenly changed. With no intension of bumping anyone, Shannon got the spot - and in color! She went about her business, just like the day before, painting for the crowds. She didn't even know she was in the paper - let alone the front page. Cynthia's boyfriend came to Shannon, pointed at the front page, and said, "I don't know who you are - but Cynthia would like to meet you." Shannon met with Cynthia later that evening. Embarrassed and nervous, Shannon was very apologetic. Cynthia was more then kind. As she looked through Shannon's portfolio she explained, "I have known these men since they were boys. I was there! You capture the fire and hunger in their eyes." They spoke at a closed bar in the hotel for nearly eight hours. A moment in time Shannon will never forget. 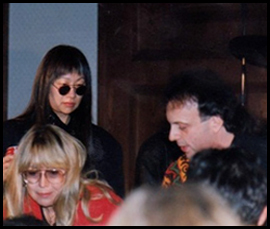 That weekend Shannon also met for the second time, long time friend, May Pang. When Bill and Ray approached Shannon on the final day of the event, Bill explained they were representatives and owners of Cavern City Tours and The Cavern (Club) and spoke of an amazing project Shannon would be pefect for. They spoke briefly and said they would be in touch. Fast forward 4 years later and a 4AM phone call awakes Shannon in her new Los Angeles home. It was Bill Heckle. "How would you like to come to Liverpool? ", Bill asked. "I can be at the airport in 20 minutes! ", Shannon said. In November of 1998, Shannon arrives in Liverpool. It was a cold day with a bit of snow on the ground and a wind that felt familiar to Chicago in February. Shannon met Bill for a brief moment and he sent her to meet the Lord Mayor of Liverpool at the Town Hall. Enroute, Shannon explained to her chaperones, "I thought the Lord Mayor was just a fictitious cartooon character in the Yellow Submarine film. He's real?!" Unknown to Shannon, she was about to be given the title, "The Worlds's Greatest Beatles Artist". She shared tea and cookies with the Lord Mayor and then signed the "great book", a book that was signed the day before by Princess Ann. She wrote: "Thank you, Liverpool. Someday I will make you my home. Shannon, The World's Greatest Beatles Artist." Shannon was soon rushed back over to Cavern City Tours where she met with Bill Heckle and business partner, Dave Jones. 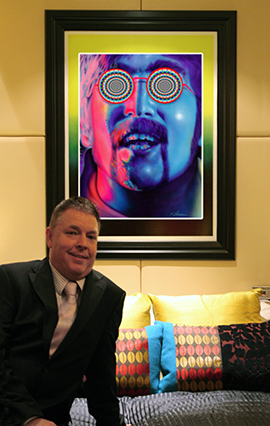 Both Bill and Dave spoke energetically of a fantastic idea they had for a Beatles themed hotel. Each bedroom would tell the story of The Beatles from birth to present day. But, there was a piece missing to the grand puzzle. They couldn't use original photographs. It was too costly and it would take far too long to get all the photographers and Apple Corp to sign off on each photo. Also, some historical points just didn't have any photographs to coincide. "But that is where you come in, Shannon! ", Dave said. "With you, we don't need photographs. You can paint the images. You see, you are the missing piece to the puzzle." 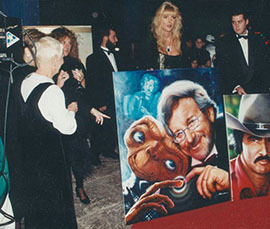 Shannon’s art has garnered the most gratifying of accolades, the enthusiastic support and approval of celebrities themselves and those within the industries in which they have achieved notoriety. 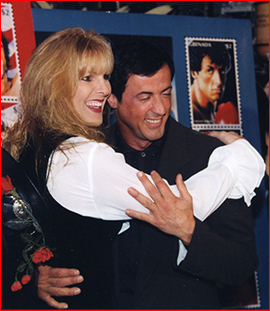 One such celebrity, Sylvester Stallone, expressed his sincere appreciation and overwhelming support to Shannon personally moments after unveiling a five postage stamp tribute to the Rocky series on the 20th anniversary of the release of the United Artists’ Oscar winning motion picture, Rocky, in November of 1996 at New York City’s Planet Hollywood. Shannon worked with Sly again, on the development of the European illustrated movie poster for, "DRIVEN". Shannon’s highly acclaimed Rocky postage stamp tribute followed other successful stamp design projects. Within the preceding years…James Dean, Jackie Kennedy, Muhammad Ali, Elvis Presley, Diana / Princess of Wales, JFK Jr. and others. All postal stamp designs receive national and international recognition. In the fall of 2002, Cleveland's Rock and Roll Hall of Fame celebrated "Guitarmania". 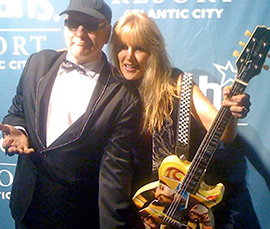 Shannon, and other celeb artists such as Yoko Ono; Peter Max; and Wyland, came together to paint giant, 10', fiberglass, Fender Stratocaster Guitars, destined to decorate those Cleveland streets of Rock n Roll. Good Morning America's, Tony Perkins, was there and spotlighted Shannon's Guitar as "by far" his absolute favorite. Other News Teams, from around the world, joined in to agree. 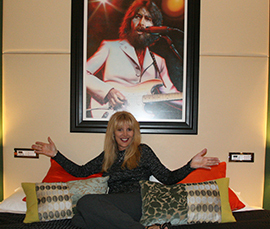 Shannon’s art, has since, been welcomed into the Rock n Roll Hall of Fame’s personal gallery. The announcement of the merging between King Features (Betty Boop, Popeye, Beatles Original Cartoon, etc.) and Shannon, with her motorcycle chopper creations…Phantasy Choppers®, Shannon’s Bakery® and Gearheadz®, has created quite a stir in the collectables world. Shannon's artwork has been televised on The Tonight Show, David Letterman, CNN, Regis and Kathy Lee, Good Morning America, The Drew Carey Show, Oprah, Rosie O’Donnell, Leeza, Comedy Central, Hard Copy, Entertainment Tonight and many more. She has also received the “thumbs up” from the Spielbergs, The Stallones, Billy Bob Thornton, Armande Assante, John Paul DeJoria, Jon Voight, Scott Hamilton, music legends Cheap Trick, Gene Simmons, Billy Idol, Steven Tyler & Joe Perry (Aerosmith), No Doubt, Tommy Shaw, Sammy Hagar and many others.